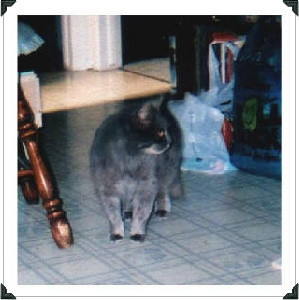 We helped ^Granny^ pass over to the Rainbow Bridge in the winter of 2004. She just had too many old age problems and we know that she only wanted to be in comfort and peace. ^Granny^ is young and playful and without any scars on her body or heart. She is buried in a little grove of trees in our backyard. We often called her Granny Angel...she is one now. Granny was a stray who arrived at our house with a tail that had been cut in half, raw and bleeding, and what looked to be a large burn on her back at the base of her tail. She had ear mites and body odor. It also looked as though someone had been hacking at her fur with scissors. We treated her injuries and mites and she had a check-up and vaccinations at the veternarian clinic. Because we already had 4 cats indoors, we decided to leave Granny outside, where we fed her and provided her with shelter. However, when the weather turned cold, I felt sorry for her and she's been an indoor cat since. Granny is getting on in years with bulging eyes and bowlegs, but we tell her that she's beautiful. She'll be safe and loved until it's time for her to go the Bridge. I will never know what I did to deserve such an awful life full of abuse and neglect. My life had become so sad and lonely it was like living in an endless, dark tunnel. I remember looking up one day and seeing a bright light shining at the end of the tunnel. The light was so bright I thought God must have sent an angel to finally end my suffering. But sometimes, even love and devotion and all the medical attention in the world can't heal a body that has been battered and broken for too long. Just knowing that my memory would live on in your heart forever gave me the strength to let go and find my way to Rainbow Bridge. Remember I will live forever in your heart and in the stars up above and my star will shine brighter with every life that's been touched by your love.